Be Bold. Be Amazing. Be Prepared. Fort Valley State University (FVSU) is a historically black university (HBCU) located in Fort Valley, Georgia. It is a unit of the University System of Georgia and a member-school of the Thurgood Marshall College Fund. Fort Valley is approximately 100 miles (160 km) south of Atlanta, 25 miles (40 km) south of Macon, 18 miles (28 km) west of Warner Robins, and 15 miles (24 km) north of Perry. As the only 1890 land-grant university in Georgia, Fort Valley State University is a comprehensive institution that provides an education to over 4,000 students. Approximately 91% of the current student body is of African-American descent. The average age of undergraduates is 24 and the average age of graduate students is 33. Roughly one-third of the students live on-campus, and 85 percent of the student body are full-time students. The university is located in the town of Fort Valley in Peach County, the original site of the state's peach industry. Its 1,365-acre (5.52 km²) campus is the second-largest in area for a public university in the state. 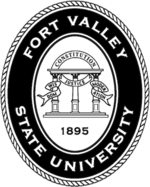 Fort Valley State University (formerly Fort Valley State College) began with the 1939 consolidation of the Fort Valley High and Industrial School (chartered in 1895) and the State Teachers and Agricultural College of Forsyth (founded in 1902). 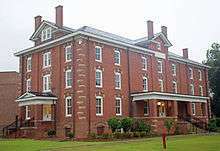 The Fort Valley High and Industrial School, previously affiliated with the American Church Institute of the Protestant Episcopal Church, was transferred to state control and operation. Under the agreement, the work formerly carried on at the State Teachers and Agricultural College was consolidated with the work at Fort Valley High and Industrial School to form the Fort Valley State College. In 1947 the state Board of Regents adopted a resolution moving the "land grant" designation from Savannah State College to Fort Valley State College. 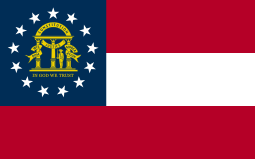 In response to the Regents' resolution, in 1949 the Georgia General Assembly officially designated the Fort Valley State College as the Land-Grant College for Negroes in Georgia. Public education was segregated at that time. The university offers bachelor's degrees in more than 50 majors, as well as master's degrees in education and counseling. FVSU is accredited by the Commission on Colleges of the Southern Association of Colleges and Schools (SACS) to award associate, baccalaureate, master's and specialist degrees. Teacher Education degree programs which are accredited by the National Council for Accreditation of Teacher Education (NCATE). The Veterinary Technology Program, accredited by the American Veterinary Medical Association (AVMA). The Family and Consumer Sciences Program, accredited by the American Association of Family and Consumer Sciences. The Didactic Program in Dietetics (DPD), accredited by the Commission on Accreditation for Dietetics Education (CADE) of the American Dietetic Association. The Child Development programs, accredited by the National Academy of Early Childhood Development Programs of the National Association for the Education of Young Children (NAEYC). Rehabilitation Counseling and Case Management accredited by the Council on Rehabilitation Education (CORE). The university also offers the Cooperative Developmental Energy Program (CDEP). Outreach services include Fort Valley State's Cooperative Extension Service Program, where extension service specialists operate in 42 Georgia counties, and the Pettigrew Conference Center, which hosts more than 500 courses and events for 51,000 patrons each year. In an effort to accommodate graduate and non-traditional students, external degree program courses are also being offered at off-campus sites in Macon, Cochran, Warner Robins and Dublin. A growing list of online courses are offered via WebCT, allowing students to pursue a number of majors, including the English Department's Technical and Professional Writing Degree Program, in the comfort of their own homes. The College of Arts and Sciences, at Fort Valley State University, is the oldest and the largest college at FVSU, housing 12 academic units, offering nearly 80 percent of the courses taught at FVSU, servicing the University System of Georgia’s Academic Core, and providing over 20 undergraduate major fields of study. The Department of Business Administration and Economics is the largest academic department in the College of Arts and Sciences. The School of Business Administration and Economics is an accredited member of the Accreditation Council for Business Schools and Programs (ACBSP). The College of Education is an educator preparation program offering degrees in Middle Grades Education, undergraduate and graduate; Agriculture Education, undergraduate and post-baccalaureate; Early Childhood / Special Education undergraduate; School Counseling; Early Childhood / Special Education graduate; Health and Physical Education; Family and Consumer Sciences Education; and an MAT degree in the secondary teaching areas. The College of Agriculture, Home Economics & Allied Programs is ranked 25th nationally in the production of African American agriculturists and the university’s leader in placing first-time applicants into medical, dental, veterinary and pharmacy schools and colleges since 2001. The college has laboratories in the state, and scientists are securing grant funds and conducting cutting-edge research. Named in honor of the late former President Dr. C.W. Pettigrew who served from 1973–1980, the C.W. Pettigrew Farm and Community Life Center is a full-service conference, convention, and fine arts facility where events are held by both internal and external sources. This faculty is often used for outreach programs for members of Fort Valley State University and by personnel throughout the region. The Anderson House is Fort Valley State University's oldest building and houses the Biggs Collection. The Museum and Welcome Center is located on the corner of University Drive and Wright Street, across from Saint Luke Episcopal Church. The center provides an official reception area for visitors to the university. Anderson House was the residence of F.W. Gano, one of the university’s founders. It is the oldest facility on campus. Fort Valley State University historian Dr. Donnie Bellamey places the building's construction in the late 19th century. This colonial Dutch revival style was a popular architectural design for rural cottages of that era. The house was renovated in 1918 and served as the family home for principal Henry A. Hunt, President Horace Mann Bond, and President Cornelius V. Troup. It was named in memory of Benjamin S. Anderson, who served as Professor of Agriculture during the institution’s early years. The main exhibits and displays come from the Biggs Collection of period furnishings, silver, glassware, china, quilts, linens and civil war memorabilia. The majority of the items date from about 1860 to 1900. The English Victorian furniture outfitted the parlor, dining room and bedrooms of an antebellum home in Box Springs, Georgia, which still stands today. The contents of the home were bequeathed by the plantation owner to Mr. Biggs' grandmother, who was a slave. The Smithsonian Institution sought to obtain the quilts and antiques for its permanent anthology of historical collectibles, according to Mr. Biggs. However, he chose to donate the entire collection to Fort Valley State University in 1991. FVSU students have several opportunities for extracurricular involvement at the university, including NCAA Division II intercollegiate athletics, marching band, concert choir, Baptist Student Union Choir, forensics (intercollegiate speech and debate), and cheerleading. There are more than 70 clubs and chapters of major Greek-letter organizations and social organizations on campus. FVSU also has a radio station (WFVS-LP 104.3 FM) and a television station (FVSU TV), as well as a college newspaper, The Peachite. Athletic opportunities include intramural sports and intercollegiate men's basketball, cross country, football, tennis, and track and field, and women's basketball, cross country, softball, tennis, volleyball, and track and field. The school currently competes as a member of the Southern Intercollegiate Athletic Conference. In 1952, Fort Valley alumna Catherine Hardy won a gold medal as a member of the winning 400-meter women’s relay team at the Olympic Games at Helsinki, Finland. In 1969, the Fort Valley State football team set the modern-era record for most points scored against a college opponent, with 106 points against Knoxville College (October 11, 2011). 11 Wildcats have played in the NFL. In 1995 Tyrone Poole became the first football player from Fort Valley State University to be selected in the first round of the NFL Draft. In 2006 alumnus Rayfield Wright was selected to the NFL Hall of Fame. The President of Fort Valley State University is the chief operating officer of the university. The position is sometimes called the chancellor or rector at other American colleges and universities. The current president of Fort Valley State University is Dr. Paul Jones, who has held the position since December 2015. ↑ "US News College Rankings: Fort Valley State University". US News World Report. Retrieved 6 January 2013. ↑ "Eddie Anderson". databaseFootball.com. databaseSports.com. Retrieved 2013-03-11. ↑ "Nick Harper". databaseFootball.com. databaseSports.com. Retrieved 2008-02-29. ↑ "Greg Lloyd". databaseFootball.com. databaseSports.com. Retrieved 2008-02-29. ↑ "Rayfield Wright". databaseFootball.com. databaseSports.com. Retrieved 2008-02-29.